Ever since establishing its Community Involvement Team in 1997 to coordinate employee participation in community outreach projects, CUC has lived up to its vision of being “Committed to Cayman’s Youth” and “Making a Positive and Lasting Difference in Our Community”. Over the years, employees have contributed hundreds of ours participating in various community projects, especially youth-oriented activities. This has been especially rewarding for employee volunteers who are willing to spend their lunch hours, evenings and weekends to serve as mentors for young people in various organisations, including the Cadet Corps and the Big Brothers Big Sisters Programme. Other programmes that are near and dear to CUC’s volunteers include the special friendships they enjoy with differently-abled young people from the Sunrise Adult Training Centre and the Lighthouse School. In 2000, our employees established the CUC Children’s Fund, which allows them to make annual contributions to assist organisations dedicated to accommodating the needs of our young people. Each year, contributors select benefactors of the Fund, which have included the Island's primry schools, the Lighthouse School, the Sunrise Adult Training Centre, Big Brothers Big Sisters and the Family and Children Services Unit. In addition to these benefactors, the Fund has also contributed to various fundraising efforts for children who are ill, one of whom underwent a successful liver transplant in June 2007 and another who had a serious heart condition. This Fund facilitates a greater sense of involvement in the community for our employees, as it allows them to determine the causes they would like to support each year. In an effort to promote academic excellence through sports, the Company decided to sponsor the Island's existing primary school football league and in 2005 re-branded it as the CUC Primary Football League (PFL) under an initial six-year commitment with the Ministry of Education. 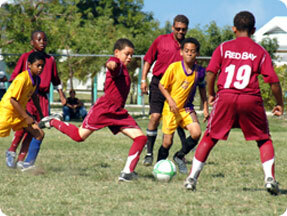 Now in its eighth year, the PFL boasts participation of football teams from 18 public and private primary schools across Grand Cayman and Cayman Brac. The PFL has the backing of employees who have served on the Cayman Islands National Football teams and continue to participate in the sport, either as players, volunteer coaches or referees. 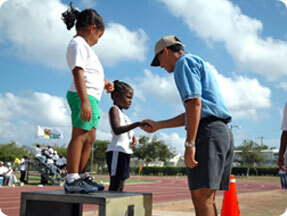 The Company has also been a staunch supporter of athletics, and after a 25-year “track record” with the Cayman Islands Athletic Association (CIAA), recently signed a second quadrennial sponsorship agreement, further solidifying its relationship with Cayman’s rising track stars such as javelin thrower Alex Pascal and high jumper Ashleigh Nalty and Olympians such as 100m and 200m sprinter Cydonnie Mothersill, 110m hurdler Ronald Forbes and 100m sprinter Kemar Hyman. The talents of these three Olympians and many others continue to be identified during the annual CUC National Youth, Junior and CARIFTA Championships, which serve as the qualifying meet for the CARIFTA Games, the premier track and field youth championships in the Caribbean. For over two decades, the Company has sponsored the CUC 800m Sea Swim, which attracts a large number of young swimmers, some of whom have been making their mark in the region and on the international circuit. 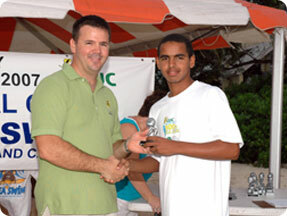 This Sea Swim forms part of the Cayman Islands Amateur Swimming Association's(CIASA) annual swim circuit. Additionally, in an effort to promote all sports on the Island, the Company continues its support of the Island Games, which are held every two years in one of the 25 member islands. We are behind them all the way as they strive to set new records and bring home the gold! Our participation in Reading Day and sponsorship of the annual Reading Week allow us to play a greater hands-on role in promoting the importance of literacy in our schools. The Company donates used computers to primary schools and various youth groups, who spend the summer months discovering the intricacies of computers. Educating students on the production and safe use of electricity, careers in the electrical industry as well as the important role they play in conserving energy is also highlighted during Career Days and specially organised Safety Days in collaboration with the Company-sponsored Environmental Education Programme in the Island's public primary schools. Our employees also enjoy visiting summer camps with the Company’s mascot, Sparky, whose presence helps promote the Company’s electrical safety message. 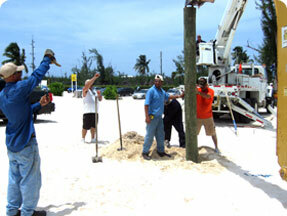 Other community projects that attracted a large number of volunteers include the annual Earth Day roadside and underwater cleanups organised by the Cayman Islands Chamber of Commerce and the restoration and beautification of the Seven Mile Public Beach in conjunction with the Leo Club of Grand Cayman. We are proud of the contributions of our volunteers and wish to applaud the volunteers from MasTec Inc., our line subcontractors, who partnered with us on the Seven Mile Public Beach project as well as the beautification of several other parks and beaches. With the continued participation of our employee volunteers, we will continue to blaze new trails by supporting our next generation, the youth of Cayman, as positive role models committed to helping them to truly appreciate the importance of doing their part to help maintain harmony in our community. Each year at the Company's Long Service Awards luncheon, we award our Top 10 volunteers and all other employees who contributed selflessly to our community and young people. CUC will continue its position as a model community leader by fostering employee voluntarism and providing support to youth-related activities. One of our corporate targets is for each employee to volunteer for eight or more hours to our community projects per year. Focusing on the community is an integral part of CUC's business strategy, and the Company is committed to making Cayman's future a bright one.